Amazingly detailed infographic on YouTube sensationalism, including data on revenue, demographics, YouTube celebrities (and their respective revenue streams). Pretty fascinating and eye opening stuff. YouTube has become such an integral part of our society and the way we share, it's truly fascinating the kind of impact it's had on pop culture. She loves you, she loves you not… What would be the answer if you asked this to your Xbox One? Of course she loves you. Find out why in our latest infographic. Improve your coffee knowledge and fatten your pockets with lots of frugal ways to enjoy a cup of coffee in the comforts of your home. Learn how to brew and prepare your favorite coffee blends and pick up perfect coffee pairings in this infographic from FinancesOnline.com. This infographic displays what cars usually fail on, tips, and general facts on car MOT's. 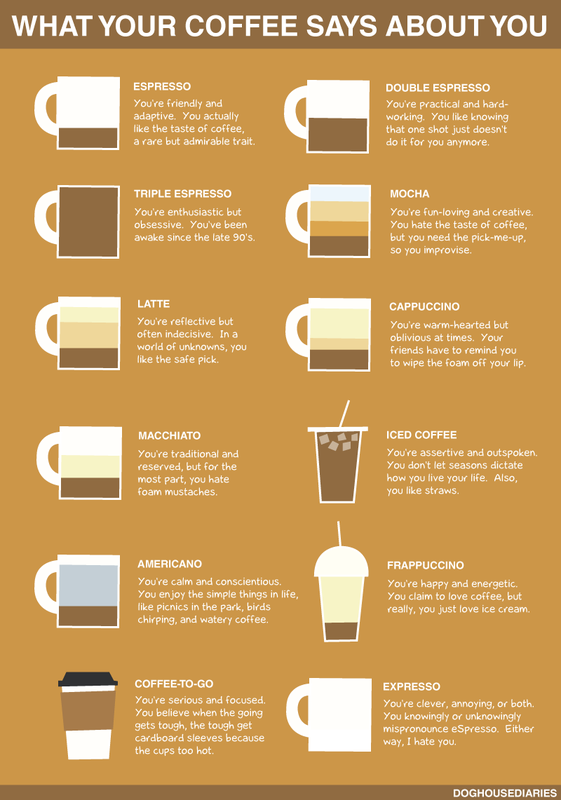 Who doesn’t love to play the game of decoding the personalities of complete strangers with their choice of coffee, dog, sweater, what have you? Go to town with this fun infographic courtesy of DoghouseDiaries! The world’s most populous towns feature skylines of cloud-skimming skyscrapers. These immense buildings were once reserved for businesses, as residential areas expanded. Nowadays, however, these towering giants are becoming home sweet home to families around the globe. Did you know that how you write can indicate more than 5,000 personality traits? The size of your letters, spacing between words, shapes of letters and more can all signify different characteristics. Handwriting analysis (also known as graphology) can even be used for detecting lies and revealing possible health ailments. Check out the infographic below to learn what your handwriting says about you. It's also fun analyzing the handwriting of your friends and family members, so be sure to hand it off or pass it along! Vet Medic have created this unique and comprehensive infographic about the world famous dog show Crufts. The infographics is bursting at the seems with facts, trivia and cool information about the biggest name in dog shows. As the old saying goes “It takes money to make money,” and that’s becoming more and more true of a college education in the United States. There are over 213 million pounds of fireworks sold every year, and each firework is a display of precision and scientific creativity. This infographic from Ghergich & Co. outlines the innards of a firework, including the bursting charge, the stars, and the black powder-all precisely mixed to give audiences everywhere an unforgettable light show. This infographic also breaks down the nation’s largest fireworks displays by the number of shells at each show and by the number of spectators. Finally, the image outline the shows in D.C, Boston, Massachusetts, Tennessee, Seattle, and Addison, Texas; a small town of 15,000 that brings in over 500,000 spectators!